Last week we brought you instructions on how to build a terrifically cute GONK droid, and this week we’re excited about the brand new trailer for Star Wars: The Last Jedi, so we’re revisiting the Star Wars universe for one of the more unusual ships. 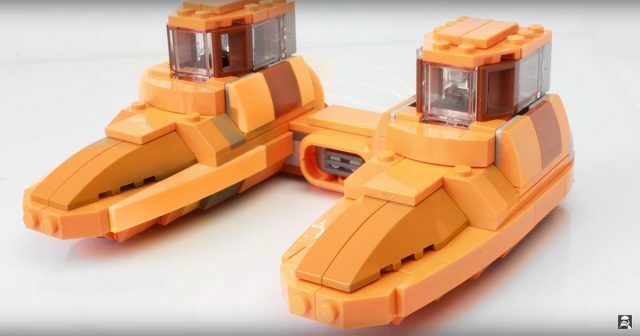 Although only seen in a few quick shots in The Empire Strikes Back, the little Storm IV Twin-Pod “Cloud Car” struck a chord with fans, including LEGO builder hachiroku24, who’s built an awesome minifigure-scale version. LEGO produced a single minifigure-scale set of the tiny two-seater craft back in 2002, but not only was it the wrong color, it wasn’t particularly detailed. This version is much improved, adding cool details like the engine intake between the pods and smoother curves. Best yet, the builder also gives us instructions for it in this handy video walkthrough, so you can build your own Bespin security ship.